Helgi was a Nord child from Morthal. She was the daughter of Hroggar. She and her mother died in a fire that destroyed their house. You will meet her ghost while investigating the fire. She will help you find the culprits. After you finish the quest, she will thank you for avenging her and her mother, and will "go to sleep". She wears child's clothes and a pair of shoes. 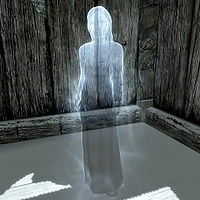 If you get into a fight near her burned house (with Benor, for example) between talking to the Jarl about the burned house and agreeing to play hide and seek with her, Helgi may step out into the open to spectate. No one will react to her presence. This page was last modified on 15 October 2016, at 22:48.